The time is once again upon us. As the evenings get darker, the leaves turn to rusty hues and the thicker sweaters get dragged from the closets we head into the Fall TV season. We can start looking forward to ongoing sagas of long-running shows, sophomore surges of last season’s new favorites and the anticipation of the wonder that is a series premiere. 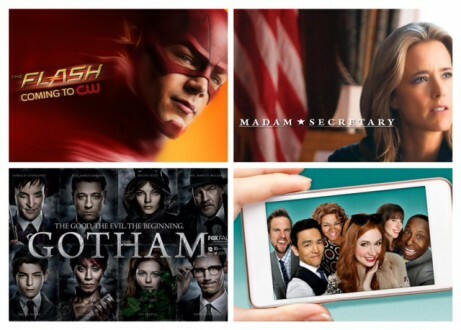 With that in mind I decided to preview four new shows that will be gracing our screens this fall and I’ll revisit them at the mid-season break around Christmas to see where we stand. When Barry Allen (Grant Gustin) appeared in the season 2 episode of Arrow The Scientist it was apparent he had a role to play in the future of the franchise. Not only did the character hit it off immediately with Felicity Smoak (Emily Bett Rickards), much to the chagrin of Oliver Queen (Stephen Amell), but the origin story of who would eventually become The Flash was immediately compelling to me. Gustin brought a vulnerability and humor which instantly appealed. Add that to his scientific prowess and I have a feeling this incarnation of Barry Allen could go far. Spinning off from a show as popular as Arrow could definitely have its pitfalls; there will be high expectations from all sides, but I feel The Flash could easily live up to those. Resident bad guy group The Rogues will be heavily featured and when I recently spoke to Chad Rook, who will play Weather Wizard, his obvious excitement and enthusiasm for the show was definitely infectious. From the trailer the pilot looks to be VFX- and stunt-laden, not unusual for a premiere as it attempts to draw in a large audience, but it sounds as if that won’t be dropping off once the show gets into full swing. Crossovers with Arrow and an appearance by John Wesley Shipp (Barry Allen/The Flash in the TV show from the ’90s) are adding to the appeal of this. I do hope the show lives up to the hype that’s been building with the intense advertising campaign over the summer but I actually believe it will! The West Wing is one of my all-time favorite shows so when I saw that CBS was premiering its own political drama this fall, I sat up and took notice. Then I saw the cast and realized this was something that could be very interesting. Tea Leoni is Elizabeth McCord, the Secretary of State newly appointed at the request of the President because of her experience as a CIA analyst as well as her apolitical ideals. McCord juggles solving world problems and being a working mother with the support of her husband, Henry, who is played by Tim Daly, someone who brings a gentle humor and depth to any role he tackles. Leoni herself has a commanding presence and I can see why she was a solid choice for a role that requires confidence and intelligence while being able to tap into the vulnerability and insecurity inherent with being appointed to such a prestigious position. The backdrop of the White House should give the writers plenty of material if the show continues and it will be interesting to see how McCord handles her home life, although I do hope they try to avoid becoming too “soapy”. With the established success of The Good Wife we know CBS supports strong female roles so I have high hopes for Madam Secretary. Another DC Comics offering, Gotham will shed light on the life of Detective James Gordon (Ben McKenzie) before he becomes the famed Commissioner Gordon, Batman’s reluctant ally. An ensemble cast will bring together well known characters such as Selina Kyle/Catwoman (Camren Bicondova), Oswald Cobberpot/The Penguin (Robin Lord Taylor), Edward Nigma/The Riddler (Cory Michael Smith) and the beloved Alfred played by the ever enigmatic Sean Pertwee. Jada Pinkett Smith is Fish Mooney, a renowned gangster who sets about molding Gotham’s criminal element into the alter-egos for which they would later become infamous. Gordon and his partner Harvey Bullock (Donal Logue) patrol the streets of the dark city, battling crime families and corruption. Gotham City has always been a fascinating world to watch from a purely artistic view, with a dark atmosphere and it looks as if the Fox version is following that trend. I have some concerns over the expansive cast and I’m hoping the characters will be given the chance to develop fully. Fox’s penchant for switching up the order in which episodes air has been the death of some fan favorites such as Firefly and Almost Human. With a large cast, airing out of order would be detrimental to the viewer’s ability to connect with each storyline, a definite concern of mine. But with the quirky comic book mind of Ben Edlund attached as both a writer and producer and executive producer Danny Cannon’s solid background in genre TV I think there is a lot of potential for this interesting premise.